Guides are the core group of the CGI and the group that the whole movement is named after. 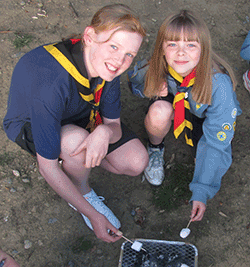 Aged from 10 to 14, Guides are able, with their Leaders' help, to take a much more active part in organising meetings and in indoor and outdoor activities and events. There's also a huge range of challenging and fun badges for Guides to choose from. 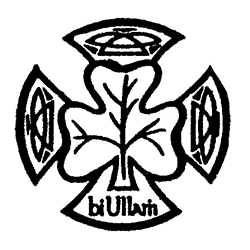 The badge consists of a Celtic Cross with a shamrock superimposed. The tree of life is engraved on the shamrock. The Guide Motto, "B� Ullamh" - Be Prepared, is on the base of the Cross. A wedgewood blue sweatshirt with logo. An interest badge system also applies in the Guide Section. This gives the Guide the opportunity of pursuing a wide variety of interests of their own choice. The Guide can start working on any of the interest badges as soon as they are enrolled. They range from Irish Speaker to Campcraft to Life Saver. There is a wide range of badges so every Guide will find something that suits them.